Balbeag – “the little settlement” is a comfortable and well appointed family holiday home with four bedrooms, sleeping up to 8 people. 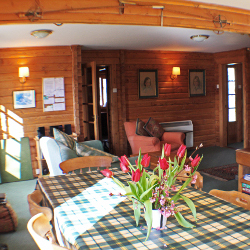 Set amidst the splendour of the Cairngorm National park, in its tranquil position on the approach to Glen Feshie, the cottage has far reaching views across the Spey Valley. Within these peaceful surroundings it’s not unusual to see local wildlife including pine martens, red squirrels and roe deer feeding close by. Built of pine logs in traditional “Scandinavian” style, the cottage provides a clean, warm and inviting atmosphere for family and friends alike. 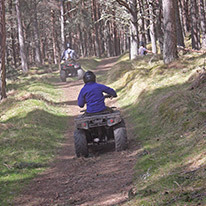 A full range of equipment including satellite television, wood burning stove, unlimited wi-fi and barbecue will guarantee a carefree break. With a spacious living/dining room, open plan kitchen and versatile, cosy bedrooms, Balbeag offers you an excellent base for a great holiday whatever the weather or time of year. There are several words that can be used to describe this cabin, beautiful, peaceful, serene, magical; as a family we needed to escape, this was the most perfect bolt hole……The scenery is simply stunning leaving the eyes hungry for more…..A truly fantastic time had by all and I don’t know if we will hold out a whole year before returning! We’re on our 5th visit here and are eager for more. 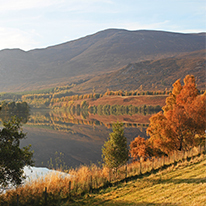 Balbeag suits us so well – a comfortable well equipped ‘characterful’ house with a tucked away feel yet close to amenities and a huge range of delights, mountains, lochs, walking, photography, hiking etc etc.